J. and I only made the switch to organic dairy about six months or so ago. I know, I know – I want to ask myself what took us so long, too. But then I remember that we’ve been buffeted about by the rotten economy, just like everyone else; and from the time L. was about a year and a half old, until just around the time I started this blog, we were in no kind of financial shape to be choosy about anything. Despite our advanced degrees and relative good standing in the workplace environment, we experienced joblessness, mounting debt, and underemployment right along with most of the country. I spent a lot of time trying to figure out how to get all our food, household supplies, diapers, etc. for under $120 per week – and this is in New England, where a non-organic gallon of milk is already almost four bucks at the typical grocery store. So the fact that we woke up one day and realized that organic dairy was actually a viable choice for us at ALL is still something I almost can’t believe. Anyway, now that we’re on the organic milk train, I think we’ve spent more time thinking about the distinct difference in the taste of the stuff than we have worrying about the markup to our grocery bills. Unsurprisingly, it tastes like…well, like what I imagine milk probably tastes like, rather than what I always THOUGHT milk tasted like. And when I used some organic heavy cream in our pumpkin bisque on Halloween night, I couldn’t help noticing that – once applied to the soup – it had an almost cheesy flavor. Not unpleasantly or strongly so, but enough to get my wheels turning. Fast-forward to Monday night, when I was putting together the component parts for a slow cooker broccoli-cheese soup. 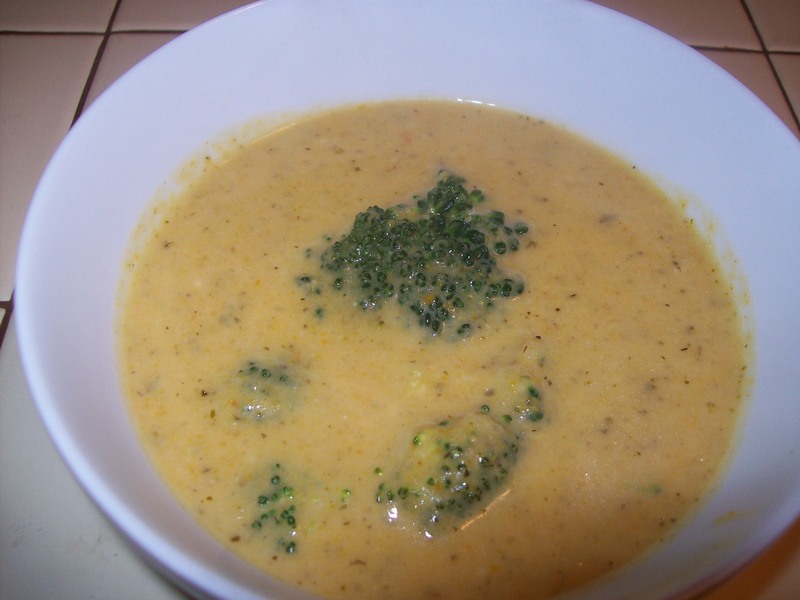 I haven’t often made broccoli-cheese soup in my lifetime; I don’t find that I’m happy with many recipes for it, in addition to which, most of the moments in time when I’ve considered it were back in the days when I thought low-fat and low-calorie were the healthiest ways to cook and eat. Now that I’ve sworn off the low-fat craze as the basis for my cooking, broccoli-cheese soup has worked its way back into my subconscious mind. I still wouldn’t recommend making and eating it ALL THE TIME…but in my current relationship to Food-As-Whole-Ingredients-Not-as-Component-Nutrient-Parts, I figure it’s a good occasional indulgence. So as I pondered what to throw into the slow cooker to create the all-day-simmered broth for the soup base, my mind wandered back to Halloween night and that subtly cheesy pumpkin bisque. Before I could examine my intentions too closely, I grabbed some pumpkin puree and chucked it into the slow cooker insert, right on top of the chopped broccoli stems and aromatics. Almost as soon as I’d done it, I experienced a pang of intense regret; but by then, it was disintegrating into the liquid in the pot, and I had to trust my instincts. Thankfully, when we got home on Tuesday evening – me with my brain rapidly firing on the subject of what in God’s name I would do if the soup experiment had failed miserably – the house smelled like…broccoli soup. Not GREAT broccoli soup, not yet; but broccoli soup nonetheless. I peeked curiously into the slow cooker and was greeted by the sight of an unattractive display of muted colors and textures. I would not allow myself to be deterred. Fearlessly – okay, not fearlessly, but at least with only one eye squinched shut in terror – I attacked the mess with my immersion blender, then chucked in a bag full of chopped broccoli florets I’d prepped the night before. I marched my less-than-optimistic self over to the stove and began furiously whipping a béchamel sauce, grating cheese, and waiting, agonizingly, for the moment of truth. One crystal-clear thought emerged through my focus: That’s a lot of organic cream and produce to waste on what might end up being a spectacularly lousy soup. It wasn’t an act of culinary genius, or bravery, or anything of the sort when I dumped the contents of the béchamel pan into the slow cooker morass and began stirring. It was purely resignation, born of the realization that I’d come too far in this madness to stop now. So I poured, and I stirred, and suddenly, I saw it. Yes, but dear husband of mine…that means I didn’t KILL IT. We ate the soup, gleefully – two bowls full, for J. – alongside slices of homemade butternut squash-herb bread I baked over the weekend. Pumpkin in the soup; squash in the bread; it was the meal, I said, of gourds in odd places. I don’t think anyone cared, particularly, but I sort of enjoyed knowing that our simple meal was enhanced by these silly secret ingredients that no one else in their right mind probably would have wanted to put into soup or bread. At this moment, however, it’s dawned on me that none of you likely care about the Great Pumpkin Revelation; you’ll be happier to realize that this is a darned good Overnight Soup (or all-day soup) that requires only about 10 additional minutes of easy preparation after it’s simmered completely to make a comforting and delicious thermos-ready lunch. Or, obviously, a warming dinner on a crazy weeknight. Or a contribution to the office potluck, which is what I did with the leftovers – and they were just as good the second day. Whenever you decide to make it, it’s worth the (very few, very simple) steps. You could even serve it in a gigundous bread bowl. I’ll never know. Put the butternut squash cubes and garlic into a large pot and add the water — you only need enough water to cover the squash and garlic by about a half-inch, so the amount is approximate depending upon the size of your pot. Cover with a tight-fitting lid and bring to a boil. Reduce the heat to low, and simmer about 15 minutes, until the squash and garlic are very tender. Drain, reserving 1 cup of the warm cooking liquid. Puree the squash and garlic until totally smooth. Set the squash puree and the reserved liquid aside to cool slightly. In a large bowl, combine the flour, salt, and herbs de provence. Add the squash puree and mix thoroughly. In another bowl, combine the 1 cup of reserved cooking liquid — you want it to be just the temperature of a baby’s bathwater, so please be patient in cooling it — with the yeast and honey. Allow the yeast mixture to foam slightly (this takes a few minutes). Add the yeast mixture, apple cider vinegar, and olive oil to the flour mixture. Mix until the dough comes together in a mass. It will probably be very soft and sticky. Turn out onto a well-floured surface and knead, adding flour as needed, until you have a soft dough that doesn’t stick to your hands. Place the dough into a clean, oiled bowl and rub the top of the dough with olive oil. Cover with a towel and allow to rise in a warm place for about 1 hour, or until doubled in size. Cut the dough into two equal pieces. Shape into loaves and place in greased loaf pans (alternatively, you can make 24 small balls and place into greased cake tins for dinner rolls). Cover and let rise again until doubled. Preheat the oven to 350. Bake the bread for 40-45 minutes, until it’s golden brown and the loaves sound hollow when tapped. Allow to cool slightly before cutting. This entry was posted in Cooking, Feeding kids, Food culture, Lunchbox, Parenting, Slow cooker and tagged baking, bread, cooking, family, feeding kids, food, Household organization, lunchboxes, parenting, potluck, recipes, school lunch. Bookmark the permalink. What would you sub for Herbs de Provence in the bread if, like me, that isn’t a go-to herb blend to have on hand? Oh, NOOOO! Feel better soon. 😦 No worries, I’m not grammar policing the comments section! Oh, good question! Thyme would be BEAUTIFUL. Rosemary would also work. Thanks for this, Deb! We love herbs de provence with butternut squash, but then again, we love it on everything, too!